“The Mbankment” offers over two miles of new social amenities and public spaces along the edge of the river. Defined by a new geo-engineering technology, it is constructed as a modular fabric that blends land with water, diversifying water-edge experiences and ecologies. Thriving wetlands and aquatic habitat merge seamlessly with pathways for strolling, jogging, cycling and access. Along the way are a variety of destinations – a performance theater, a swimming pool and fitness area, a climbing wall, picnic and overlook spaces, kayak launches and newly expanded parkland. The Mbankment is constructed NOT as a channelized river with a raised walk, but as a newly made edge, where water and land blend – fortified against erosion and use as well as absorptive and accommodating of ecological processes (flood, stormwater management, water quality improvement, and habitat diversification). 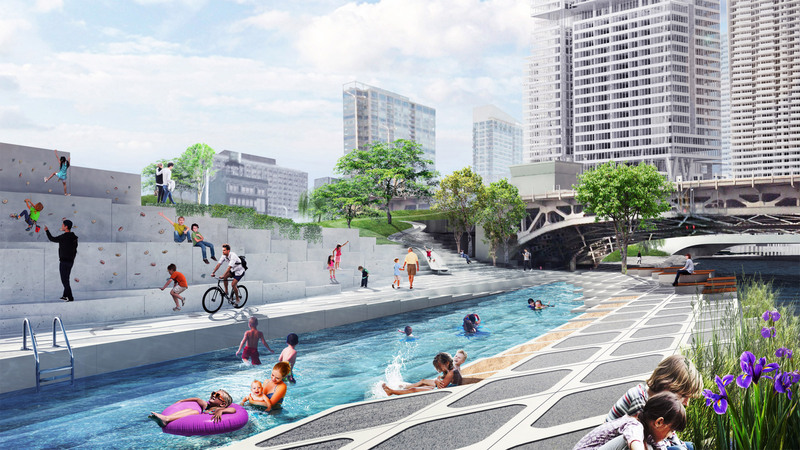 Individual pre-cast cellular units create a flexible honeycomb-like edge, a matrix that folds and adapts to local circumstance, and creates a variety of distinctive settings along the river. 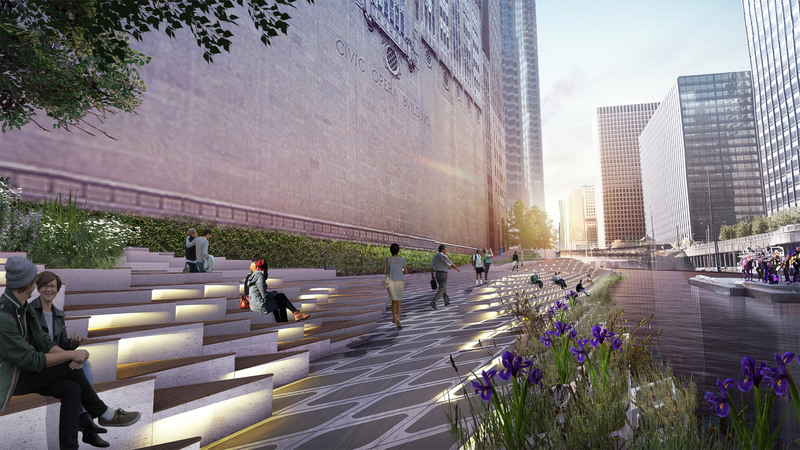 This creates a “place,” a river-walk, with various destinations and features, not unlike London’s South Bank or New York’s High Line. In these instances, communities, institutions, habitats and businesses thrive together. Like much of Chicago architecture, The Mbankment offers a bold technological expression, both practical and iconic, while at the same time creating a new hip and edgy place for people to meet, use and experience. It is inviting, productive and living, a new model for life in the city. “River Wall” The channelized river wall limits access, dimension, bio-diversity, and ecological function. “River Wall” - Today’s channelized river wall limits access, dimension, bio-diversity, and ecological function. “MBankment” - A new river edge system simultaneously retains, softens, absorbs, and activates a more dynamic river edge. 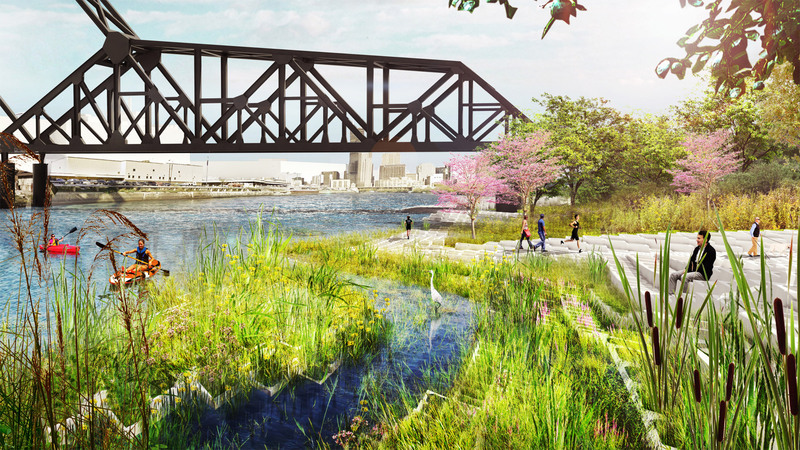 The system allows for infinite possibilities for shaping, folding, blurring, and building a new river edge that is both socially and ecologically diverse. Individual “Building Blocks” can be combined to create a resilient and flexible topographic surface along the edge of the river. Each block lends itself to myriad functions from paving, to furnishings to plantings and wetland creation. We are landscape architects and urban designers committed to the innovative design of public spaces. We believe in the authenticity of real cities, urban places and local culture. We work in cities on complex, urban planning and design projects. We design for people. We work from the scale of the city to the scale of a seat. We work from the scale of the city to the scale of a seat. Navy Pier, Chicago, Illinois; The High Line, New York, New York; Tongva Park, Santa Monica, California; Knight Plaza, Miami, Florida.